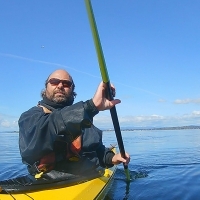 Discover what you can do with your Greenland Paddle..."
What is the quickest way to paddling with competence? I have stopped offering group lessons because I can give you quicker results with lessons that are specifically made for you and where you are at. Please Note: I only work with the Greenland Paddle. I have nothing against those who use something else, it's just that it's what I use. And the techniques I teach work best with the Greenland paddle.